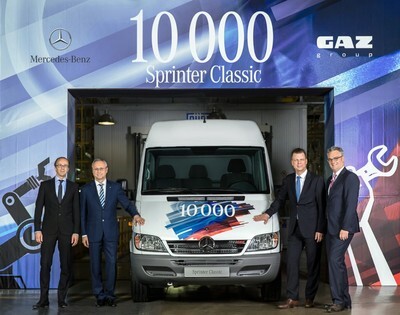 The 10,000th Sprinter Classic rolls of the assembly line in the GAZ plant in Nizhny Novgorod attended by (from left) Günther Heiden, Chief Operating Officer GAZ Group, Vadim Sorokin, President GAZ Group Sören Häse, Head of Mercedes-Benz Vans Russia and Rene Mack, Director Sales & Marketing Mercedes-Benz Vans. Soeren Haese, Head of Mercedes-Benz Vans in Russia: "The Sprinter Classic is the key pillar of our van business in Russia. This vehicle is tailored specifically to the Russian market and thus sets new standards in the large van segment". MOSCOW/NISCHNI -- June 4, 2015: It is a milestone for Mercedes-Benz Vans in Russia: just one and a half years after the start of production in September 2013, the 10,000th Sprinter Classic has rolled off the assembly line in Nischni Nowgorod. In 2014 a record figure of 6600 vehicles were sold. This makes the Sprinter Classic the most popular van from the Mercedes-Benz portfolio in Russia and in terms of its sales figures in Russia Mercedes-Benz Vans is the number one of the international transporter brands. "Mercedes-Benz stands for premium quality worldwide – including every single Sprinter Classic that rolls off the production line in Nischni Nowgorod", says Soeren Haese, Head of Mercedes-Benz Vans in Russia. "The Sprinter Classic is the key pillar of our van business in Russia. This vehicle is tailored specifically to the Russian market and thus sets new standards in the large van segment. The van's great popularity among our Russian customers shows that we are catering to their needs", Haese continues. The Sprinter has given a whole vehicle class its name and is known as a synonym for large vans all over the world. In 2015 the transporter celebrates its 20th anniversary. By now the Spinter is on the road in more than 130 countries in various types and hence an essential pillar in the global growth strategy “Vans goes global” of Mercedes-Benz Vans, which has consistently internationalized the business and tapped additional earnings potential in the new growth markets. The engineers at Mercedes-Benz have adapted the globally proven vehicle concept to the operating conditions in Russia and the specific requirements of their customers. The Sprinter Classic is a robust vehicle featuring a state-of-the-art drivetrain, highly advanced electrics/electronics architecture and a multiplicity of safety systems. As such, it offers a reliable and attractively priced means of transport for all types of business needs. The Sprinter Classic is fitted with the state-of-the-art, high-performance OM646 engine, which is built in Jaroslawl. Right from the basic model, the vehicle features the Electronic Stability Program ADAPTIVE ESP, ABS and ASR as standard, setting safety benchmarks in this segment in Russia. In addition to numerous vehicle models and in cooperation with local bodybuilders, Mercedes-Benz offers its Russian customers options which are precisely tailored to the specific customer needs. This includes vehicles for passengers with restricted mobility as well as various platforms for commercial fields of operations and mobile sales stalls. Mercedes-Benz also offers attractive financing and after-sales solutions for the Sprinter Classic in Russia. The Mercedes-Benz Sprinter Classic is produced in Russia under licence by partner company GAZ. Mercedes-Benz Vans has invested in production facilities and sales activities in connection with this partnership to the tune of 100 million euros. Over 40% of the vehicle's value is currently produced in Russia. The local production set-up has created around 1000 new jobs in Nischni Nowgorod and at the engine factory in Jaroslawl.